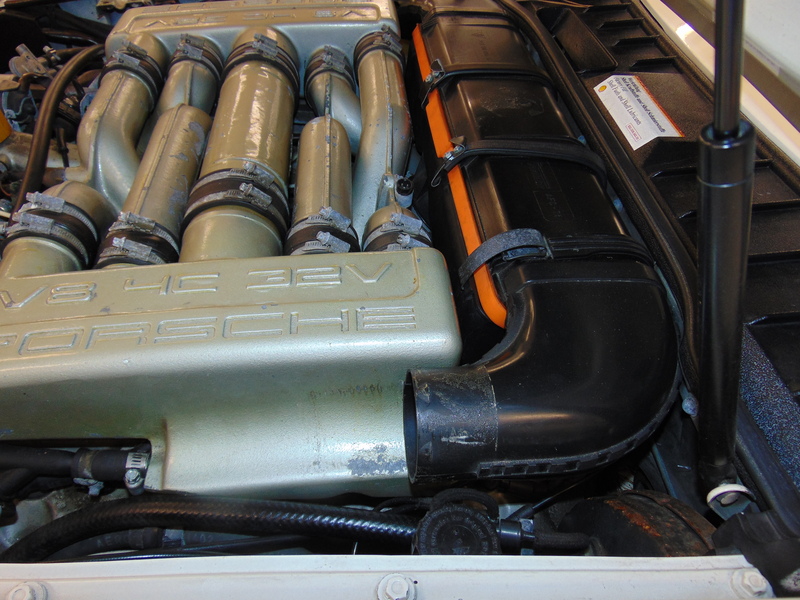 A fairly standard maintenance action for the Porsche 928 is to refresh the top end. In simple terms, there are a lot of rubber hoses and gaskets surfaces that reside in the “V” between the cylinder heads that can become worn out and possibly dangerous due to the long term degradation from the heat and vibration. So by doing a top end refresh you at minimum may wind up with a better running car and possibly you will save you and your car from the flames of a gasoline fire due to a failed fuel line. Remember, these cars are 25+ years old and although very well engineered, there is a limit to how long the various materials used can hold up. So if you don’t know if your car has every had a top end refresh, it is a good idea to do so now. 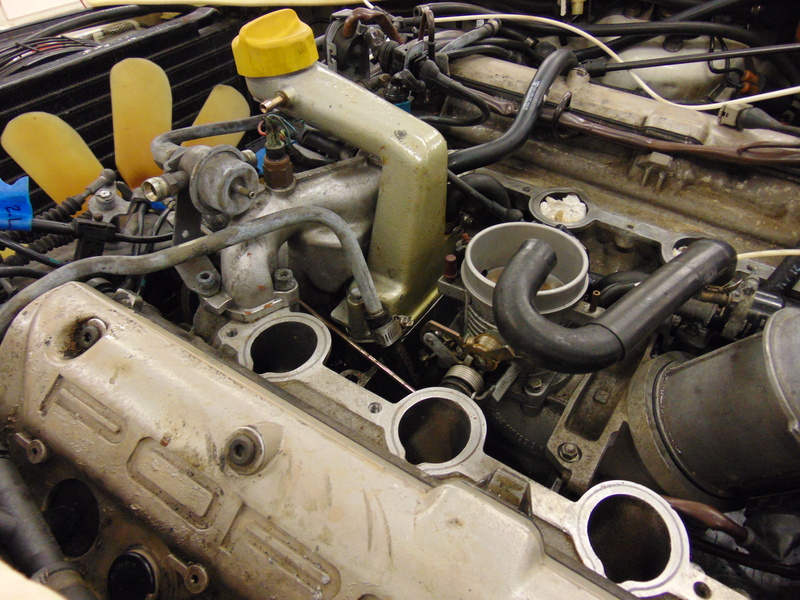 From a big picture standpoint, I wanted to replace the rubber vacuum lines, the fuel hoses, the rubber coolant lines, the spark plug wires, and any gaskets exposed as a result of dis-assembly of the parts and pieces. Plus there were a few items such as the temperature sending unit and spark plugs that are easy to change while you are in there. A bonus motivation was that I would replace all the o-rings in the AC system piping while I was in there, in an attempt to resolve a slow refrigerant leak. The previous owner had already done a top end refresh a few years ago. Based on his parts invoices, there were some items that I did not need to replace. But there remained a significant number of items that had not been replaced, probably due to cost. 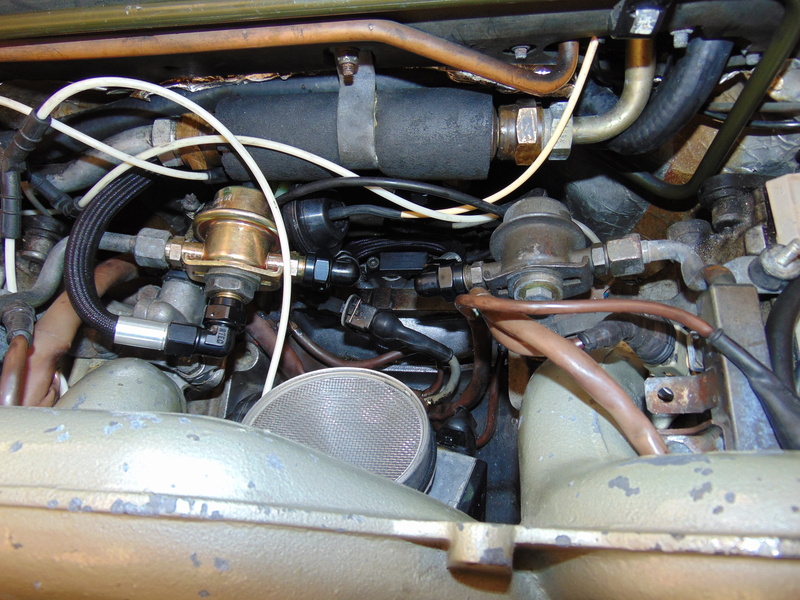 The most expensive replacement items by far were the critical fuel lines. I decided to go big and get the Greg Brown fuel lines. They are a very high quality piece of kit! I purchase the vast majority of my parts from Roger at 928SRUS. Roger is pleasant to deal with, is quite knowledgeable, and does a good job of striking a balance of cost versus practicality. There are some excellent tutorials on Rennlist, etc. about the details of this job so I won’t cover that ground again. I would especially recommend Dwaynes Garage if you want very detailed well written instructions on this and other jobs. Another one that comes recommended is by Mike Fry here. I’ve posted a parts list below so you can get an idea of the items involved and their cost. I didn’t add up the total cost of the parts but you can easily do the math and see that it added up to several thousand dollars. On one hand that would seem to be a lot of money. But we are talking about a Porsche and I bet you would find comparable prices or worse for comparable cars such as BMW, Mercedes, Jaguar, and Lexus. And let’s all be thankful we’re not working on a Ferrari! I’ve posted pictures too, although frankly it’s a little bit of jumble until you get familiar with what you are looking at. The engine compartment can be pretty intimidating but all I can say is take a ton of digital photos as you go and you’ll be all right. Two other items that I would recommend for replacement, that I had already replaced last year, are the Crank Position Sensor (CPS) and the sending unit for the coolant temperature to the CPU. In particular, I found the 3 wire plug for the CPS and the throttle position sensor to be crumbling. Not a good thing. Strangely, the harness end of these plugs seems to be in much better shape. Regardless, replacing the entire engine wiring harness is on my short list of things to do next. One thing I did was remove 1 of the 2 throttle return springs on my throttle. My car requires a lot of pedal pressure to get things moving. I checked for frayed cables and binding connections and found none. Taking out the one spring made in my opinion a nice improvement in the throttle effort. One of the toughest areas I ran into was reconnecting the intake plenums. 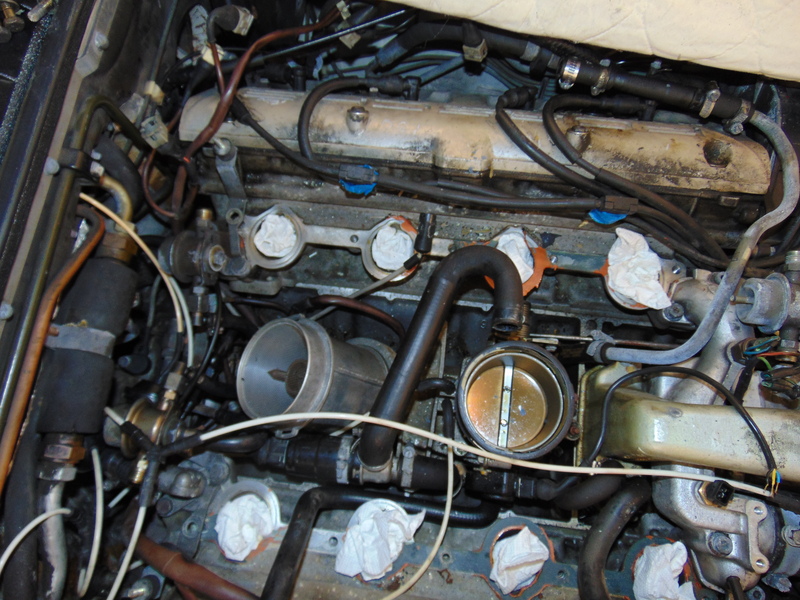 I see that the 1986.5 plenum looks different from later models. I found it to be quite fiddly to get all the open ends lined up close enough that they could be connected with the various rubber boots. It pays to take your time with this step. Well, actually I got to practice this step 3 times! Once you get the plenums installed, some connections become inaccessible. As I remember, I took it apart once to get at a fuel line connection that wasn’t tight and I took apart again to get at a vacuum connection that I missed tightening. I resisted the temptation to re-finish the manifolds this time. When I get ready to fully detail the engine compartment everything will come apart again. I was gratified that the car started right up after my efforts (after I got the 2 leaks fixed)! Another update- after a few weeks in service, I determined that the shaft seal on the A/C compressor had a slow leak. When my static system pressure dropped from 90 psi to 40 psi, I threw in the towel and ordered a re-manufactured compressor from Roger. And 2 new hoses. Knock on wood but the system is blowing cold now! Opposite hand view. White spots are paper towels stuffed into intake openings. Black braided Greg Brown fuel lines at fuel cooler area at rear of engine.